Top of the line finish work & thoughtful master craftsmanship throughout this one owner home. Not much left of the original builder grade finishes. 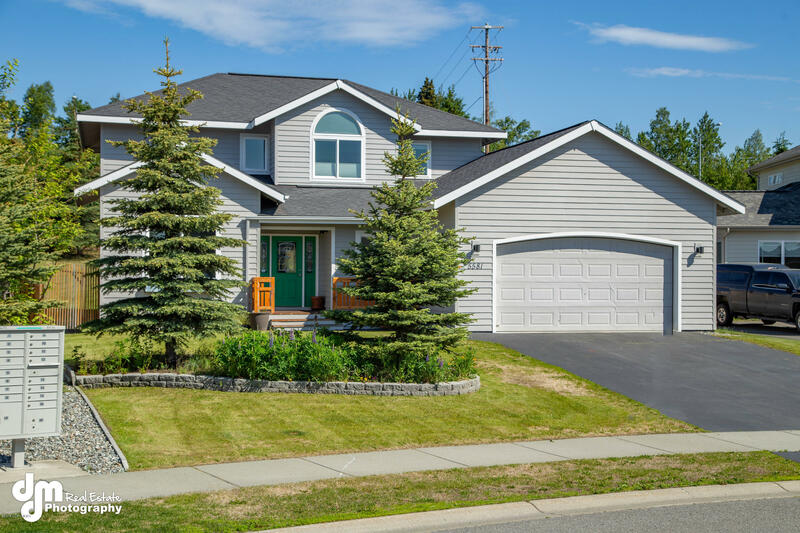 Custom cherry & maple cabinetry and built-ins, custom kitchen & bathrooms both w granite c-tops, HUGE 3 car garage and the added bonus of a spacious, fenced back yard. Better than new awaits you in this modern and delightful domicile. 5581 Yukon Charlie Loop Seller Improvements 2008 to Present. Front Entry: Removal of double closet, to expand and enlarge the front entry. Slate floor tile, can lighting, front entry sconces and custom thresholds. Downstairs bath: Custom vanity, granite countertop, inset sink basin, slate flooring and custom mirror above vanity. Stairs: Removed carpet & replaced with laminate, enlarged opening to basement access under stairs and also added lighting to the closet. Family Room: Can lighting, laminate flooring custom thresholds, slate around fireplace, custom solid cherry wood cabinets and custom solid maple wood counter top above fireplace. Kitchen: Can lighting, custom solid cherry wood cabinets, granite counter tops, custom built in sink, tile back splash, custom stainless flume for range venting and under cabinet lighting. Dining/Living Room: Laminate flooring, etc. Den: Custom shoe & closet built-ins, office desk, custom solid maple wood counter top. Master Suite: Laminate flooring in room and walk in closet, new tile flooring in master bath. Tiled shower and around jetted tub, glass shower doors, natural light window in shower, custom cabinet with double sink vanity, make up/vanity nook, can lighting and custom mirror above vanity. Bedrooms: New carpet. Upstairs Bathroom: Custom vanity, custom mirror above vanity, LED lighting behind mirror and under toe kicks, window installed in bath shower, tiled bath/shower and tiled flooring. Garage: 100 AMP sub panel for oversize electric usage, added work light in garage, work/project room in back of garage with loft above for storage. Outside: Custom front deck fence/railing, landscape bricks for raised beds, driveway seal coat summer 2018, custom fencing around back of property, shed for storage (includes lawn mower), Extended back deck from existing for entertainment with natural gas plumbed in for BBQ and added pavers/gravel on side house access.